The Rosemount Area Arts Council supports two theater groups - Front Porch Players and Second Act Players of Rosemount. Front Porch Players is a community theater based out of the Steeple Center in Rosemount, MN. This group formed in 2013 and produces plays for all ages and levels of actors: from Melodramas, to Improv, to full length Broadway plays. Everyone is invited to audition for these performances. The Front Porch Players of Rosemount has produced several shows over the past few years, including Agatha Christie’s The Mousetrap, Neil Simon’s Barefoot in the Park, Same Time Next Year, A Fine Monster YOU Are, Murder Among Friends along with several melodramas and Mystery Dinner Theaters. Winter 2019 production: "On Golden Pond " by Ernest Thompson. Performances on March 1st, 2nd, 8th and 9th. See the Front Porch Players Page for more details. Winter 2018 production: "Murder Among Friends", directed by Keith Reed. This comedy/mystery has been described as “Clever, amusing, and very surprising." - The New York Times; and "A slick, sophisticated show that is modern and very funny." - WABC TV. The Second Act Players is a theater group for seniors 50 and over, based out of the Steeple Center in Rosemount, MN. They were established in 2015 through a grant for senior theater. Several plays are produced each year. ​​Spring 2019 Production: "Uff Da." Performances will be on Friday May 3rd at 7 pm and Saturday May 4th at 2 pm and 7 pm. See the Second Act Players Website for more information. ​​Summer 2018 Production: "The Girls of Autumn" by Paul Barile. Some sample photos at right. Performances were on August 10 and 11. See the Second Act Players Website for more information. Spring 2018 production: "What Really Happened at St. Anthony's"
"What Really Happened at St. Anthony's"
This was an original play is a complilation of three vignettes written by Second Act Player members. This fun show highlighted several humorous events that took place at the fictional St. Anthony's Catholic Church. "Growing Up Catholic" was written by Carmine Olson and Jean Crewson. 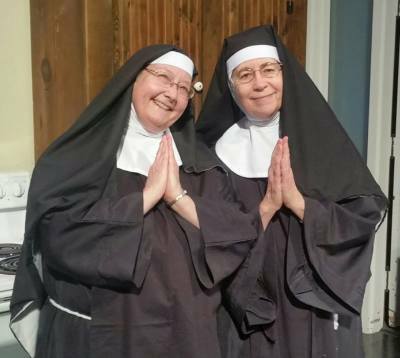 It demonstrated how easily a group of Ladies' Aid Society members can get distracted from their assigned task when reminiscing about life growing up in the Catholic church. "And Then Their Were Nuns' was written by Keith Reed. It showcased one of those memories describing what happened when a convict snuck into the convent. "Bingo Buddies was written by Faye Heffele. The church put on their weekly bingo night, showing how a bingo game affected the lives of two former "Bingo Buddies"